Despite the influential role of Modernism in our architectural heritage, many significant and often award winning Modernist buildings are endangered because of neglect, perceived obsolescence, or inappropriate renovation and some are even in imminent danger of destruction. The problem is that there is a lack of statutory protection in NSW for these post-war architect-designed buildings as they are considered too young to be heritage items and are therefore not listed. But has their significance been correctly assessed? None of the current legislation used to protect heritage here in Australia has specific criteria for listing 20th century heritage places. The methodology adopted here for the identification of heritage is generally based on and derived from the Burra Charter and conservation has always been about preserving what is important about the place. This may be a combination of its design, its fabric, its association with a person or its community or its contribution to society’s development through technical innovation or social reform. It is important to realise that buildings have heritage values irrespective of them being recognised as so-called ‘heritage’ buildings. In many cases the significance or value in the case of these Modernist houses is less about their historical significance and more about the aesthetics and architectural significance of the place as symbolic of that moment at which it was built. In a much older house time has allowed the development of other values, such as historical and or social significance. In a modern house it is often about the house as a work of art, capturing the moment. Criticism of post-war buildings is often that they were not built to last, they were replaceable and therefore the materials were disposable and less important. When assessing these buildings it is important to take into account (although not necessarily be led by) the ideas and thoughts of the site’s creators themselves. Rapid changes in technology during the century meant that many materials were superseded, or their failure to perform meant production ceased, making replacement of damaged or missing fabric problematic. In this situation an alternative needs to be used as a stop gap which resembles the original fabric as closely as possible in character. Should the item then become available, as a result of the revival of particular manufacturing techniques or salvage from another building, then they can be replaced. By comparison, it is much easier to recreate man-made materials from pre-industrial buildings. Harry Seidler argued that buildings would change over time, due to owner’s needs, changing circumstances and believed they should grow or change in a contemporary way. He felt the idea or philosophy behind the building was of great importance but the fabric and its materiality and the way it was built was also very important and often the two were closely related. However, when he worked on his buildings again he often used new materials, perhaps improving them with a greater budget. Post-war materials were rationed or in short supply and it can be argued that the architects themselves would have used better quality materials had they been available. In many of these circumstances the tenets of the Burra Charter with respect to the authenticity of original fabric are neither useful, applicable nor practical. DOCOMOMO argues that design authenticity is more important than material authenticity and suggests a new philosophical approach to conservation of 20th century heritage. Existing approaches are applicable but there are some specific technical challenges that necessitate judicious case by case consideration. What is being done to protect these buildings? 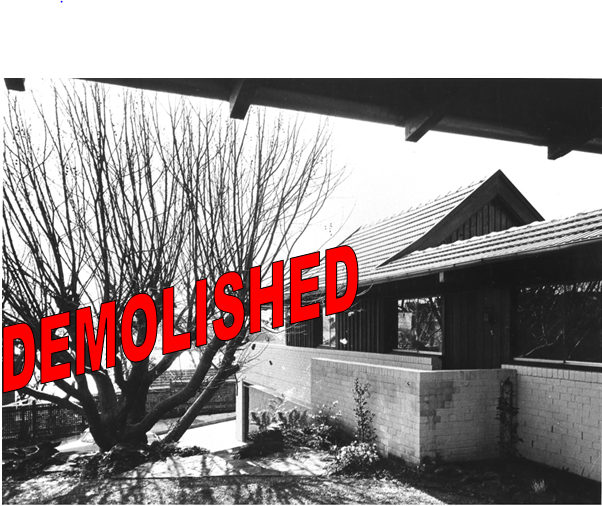 A number of organisations have been established in Australia to protect our modernist heritage. DOCOMOMO Australia is a national organisation run by volunteers involved in architecture, academia and conservation. It was established in 1999 following a public meeting held in Sydney in conjunction with a landmark conference organised by the NSW Historic Houses Trust (now Sydney Living Museums) called Opera House: Fibro House. The conference raised some of the issues facing the buildings of the early modern era and DOCOMOMO Australia continues to pursue these issues raised, as well as the aims and objectives of DOCOMOMO International. The Art Deco Society of NSW was initially formed in response to the demolition of one of Australia’s fines Art Deco buildings, the Rural Bank in Martin Place. The Society seeks to educate the public about the social, historical and architectural importance of the state’s Art Deco buildings. In November 2012 the NSW Chapter of the Australian Institute of Architects announced that it had re-named its Register of 20th Century Buildings of Significance to sharpen its focus on preserving buildings of merit, in particular award winning buildings. It now includes all buildings awarded the Sulman Medal for Public Architecture (before 1960) and the Wilkinson Award for residential architecture (after 1960) and the Harry Seidler Award for commercial architecture. The policy shift aims for “a greater recognition for the state’s award winning architectural heritage, and should also encourage both sustainable adaptive reuse and an increased consideration of the original design intent”. We really do need to build community support for the protection of the twentieth century houses. Shows like Mad Men have definitely increased the popularity of Modernist houses, which is fabulous, but this can often be short-lived. The buildings are not just significant for aesthetic reasons. The twentieth century was a period of major change, mass migration, globalisation and technological advancement. The material, scientific, social and other values of buildings from this period need to be better explained to the wider community and these aspects need to be integrated into their conservation. We need to recognise that change may be inevitable for some of the less iconic 20th century houses to survive. Design is not always of primary significance. Take a look at: The website Modern House which has been established to promote and sell architect-designed properties – Modernist, mid-century and contemporary homes of outstanding design. Susan Macdonald, ‘Harry Seidler and the legacy of Modern Architecture in Australia – Interview with Penny Seidler’, Susan Macdonald, Kyle Nomandin and Bob Kindred, Eds, 2007 Conservation of Modern Architecture, Shaftesbury: Donhead, pp101-116. Susan Macdonald, ‘Materiality, monumentality and modernism: continuing challenges in conserving twentieth-century places’, Getty Conservation Institute, Los Angeles, USA, 2009, http://www.aicomos.com/wp-content/uploads/2009_UnlovedModern_Macdonald_Susan_Materiality_Paper.pdf. Susan Macdonald, Modern Matters: Breaking the Barriers to Conserving Modern Heritage, The Getty Conservation Institute Newsletter, Newsletter 28.1, Spring 2013, http://www.getty.edu/conservation/publications_resources/newsletters/28_1/modern_matters.html . Peter Salhani, ‘NSW (AIA) heritage register refocus’, Architectureau, 14/11/2012, http://architectureau.com/articles/aia-heritage-upgrade/.